Pool cleaner or Zodiac mx8? I live in Florida so the pool is never really closed. Fully screened, no large debris to worry about but I do get a decent amount of sand/dirt or silt on the bottom. Dedicated suction line, 2 speed pump; not automated. When we bought the house 4 years ago it had a zodiac g3. Worked ok and over the years I replaced virtually everything on it a few times. 2 years ago I gave up on it and bought a cheap manual vac. I grew to hate using it and thankfully it broke last month. Rather than buy another cheap one, I am again looking into automatic cleaners. The pool cleaner seems to be a good choice though I have been reading lately on the mx8. In either case, I do not plan to purchase new; I have been watching several of each on ebay and craigslist locally. It seems both have parts readily available and I have no problem figuring out how to fix them provided it is nothing catastrophic. If cost were the same, which would you pick? Anyone used both to compare? Sorry for the quiet thread! Robots are this century pool cleaners. Lots of forum members have them. Mine works great and is the basic model from Dolphin. Call Marina Pool in Denver and they can suggest to you a model that will work in your pool and cover your desires. Thank you for the response. I am looking to stick with the configuration I have though and utilize my dedicated suction line....also stay on the inexpensive side by buying a used unit. In the long run you will probably spend more on Electricity doing the suction with your pump than running a robot, but your pool your rules! Blivit79...your pool, your rules. I can't give you any suggestions on automatic cleaners, but purchase what YOU feel comfortable with and used to. @Blivit79 nothing wrong with running a suction cleaner if it meets your needs. No reason to get more then what you need because it is the latest fad. You seem to be aware of the way suction cleaners work, the maintenance they need, and the risks in buying used. I doubt many people have had both the G-3 and the MX8 cleaners to give you a comparison. I use a Polaris 380 pressure pool cleaner. I suggest you read the reviews for both on Amazon. They both have mixed reviews. They work for some people and have died for others. You may be better at fixing them then the folks who complain. I have a 4-wheel Poolvergnuegen called "The Pool Cleaner". Is the the cleaner you're referring to? I satisfied with my suction cleaner and I don't have a rotary phone . I run it two to three hours every two to three days and it does what its supposed to. Its on its fourth season and has required no repairs or service. I have both a robot and the 2-wheeled version of "The Pool Cleaner". Both do the job just fine for getting the pool clean. 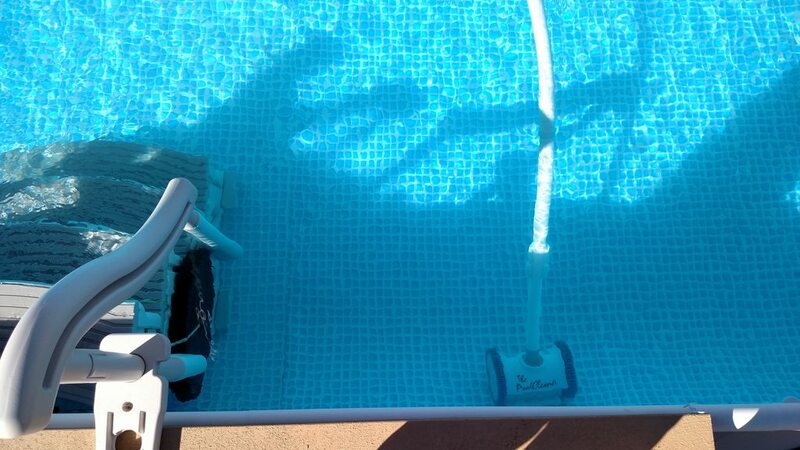 There are advantages of using the robot over the suction cleaner, it scrubs the pool surface so there is less brushing required and it uses a fraction of the electricity compared to using the suction cleaner. The debris is collected in the robot and not the pool filter. The con is the upfront price for the robot and any repair cost will be higher if needed. The only parts that I have replaced on the suction cleaner are two sets of tires in nine years. Other than that the cleaner has worked perfectly since day one. The robot has not needed any parts in two and a half years, but it does require some slight maintenance to keep the impeller free of debris such as hair. Thank you for the responses. Yes, the Poolvergnuegen, "The Pool Cleaner" is what I am referring to. My pool is relatively small and screened in so I do not need much. I was only running what I had before on the weekends for a few hours with my pump switched to high speed; all other times it was on low speed so electrical impact wasn't really an issue for me. I have no problem rebuilding whatever it is, hence my comment on parts availability. The high upfront cost of a robot is what turns me away from them. So far, the pool cleaner does still seem to be used more. The MX8 has a ton of moving parts that won't be cheap to replace a few months down the road. It does work great but the G3 Barracuda is one of the best suction sweeps, given the few moving parts, making it easier And cheaper to maintain. The G3 is relatively cheap as well. Ranging from $250 to $300 online. I don't have much experience with robotic cleaners so I can't give a good comparison between the two. i just moved from a g3 type cleaner to a zodiac mx6 elite, it is half a mx8. the difference is night and day. the elite series has little rubber fingers that scrub the surface, and has a two year warranty. the little scrubbing fingers really change the game. i can run it on low speed(have a 2speed pump) with the valve to all skimmer, and it will clean. but will not climb walls. with the pump on high it does everything.